SPECIAL CONDITIONS FOR GROUP RESERVATIONS (MORE THAN 8 PEOPLE) For reservations of more than 8 persons, we ask 50% of the total reservation cost to be paid within 7 days after the confirmation of the reservation. The other 50% will be paid 15 days before the arrival. TOTAL CANCELLATION : Cancellation is made between 15 days and the same day of the arrival, 50% of the total cost of the reservation will be charged. PARTIAL CANCELLATION : Between 9 and 3 days before the arrival we allow a reduction without a penalty of 15% of the total reservation. If the reduction is more than 15%, 50% of the exceeded reservations will be charged. 3 days before the arrival, in case of a reduction, the total cost of the exceeded reservations will be charged. NO SHOWS: In case of a no show, the hostel is authorized to charge the total amount of the reservation. When you get off the train, what do you usually see around? Coffee shops, more travelers like you, trains going everywhere... 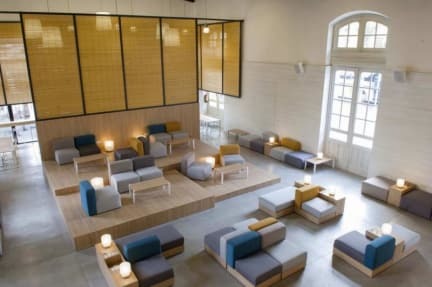 But, have you ever imagined a hostel inside of the train station? Here we are! Welcome to UP! 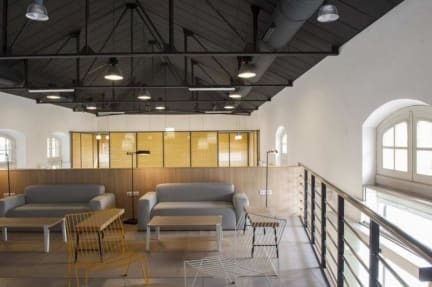 Hostel Valencia Opened in March 2016 and located in the heart of Valencia, inside of Valencia Train Station. With a new concept of accomodation in an lovely and young atmosphere. Enjoy a different concept in the city center of Valencia with live concerts, snack bar and the best & young atmosphere of Valencia! Go directly to the train station, our hostel is located inside, just in front of the railway! UP! Hostel Valencia is located in the city center of Valencia, within the North Train Station, and next to Valencia bullring and city hall. It is located 400 meters from el barrio del Carmen and a 20-minute walk from Turia Gardens. You can find several restaurants, bars, and shops within a 2 minute walk of UP! Hostel Valencia. We have 89 bunk beds spread over 11 rooms, our equipped bathrooms are shared. We have spacious common areas where you can chat and meet people in our cozy couches. We have a bar as well (GO! Bar) where you can enjoy your favorite drinks. Payment upon arrival by cash, credit cards, debit cards. This property may pre-authorised your card before arrival. Check in from 14.00 PM to 23.00 PM. Check out until 11.00 AM. Reception from 8.00 AM to 23.00 PM. Breakfast not included (continental breakfast 3€ extra). Bed linen and blankets are included in the price. Merveilleux séjour! Nouvelle hostel donc améliorations à venir. Positif : très propre, personnel aidant et sympa, prix abordables, bien situé (métro Xativà, à même la gare de trains). Négatif : douches avec un rideau et les crochets pour les vêtements sont à l'extérieur de la douche, musique fort le soir et murs peu insonorisés (mais tolérable), difficile à trouver (truc: entrer par la gare et sortir à gauche par la porte 6), le petit-déjeuner coûte 3€ mais n'en vaut pas la peine selon moi. Wooow neuf, propre, dans la gare elle même. Génial ! Personnel des plus souriants, prise partout. Casier large et profond. Rideaux. Nan vraiment top ! Le bar à l'accueil. Hostel très moderne, très propre, personnel très accueillant et serviable. Je le recommande. Cependant, quelques points négatifs : pas de cuisine, casier très très bruyant et mal agencé ( le mien, quand il était ouvert, bloquait l'ouverture de la porte d'entrée de la chambre). On rentre dans les chambres grâce à une carte magnétique, ce qui est peu encombrant mais le bruit de déverrouillage de cette porte est insupportable, surtout quand il est répété 30 fois dans la nuit. La chaleur était très pénible dans le dortoir puisqu'il n'y avait pas de fenêtre ou air climatisé. Les lits et les casiers sont en métal donc énormément de bruits lorsque quelqu'un ouvre un casier et prend son matériel. Il n'y a pas de crochets ou d'emplacement où déposer vêtements, serviettes et/ou shampoing et savon dans les douches. Emplacement en général permet d'être fonctionnel. Très basique mais ne fallait pas s'attendre à plus avec le prix payé. Vélos mal entretenue et pas de qualité. Good central location, staff friendly, just a little misgaven advise but otherwise very good. Breakfast was just ok. Rooms very nice but cold with the airconditioning. Great hostel, but I thought there was a kitchen and there was none. The location is perfect and even if it is in a train station, in my opinion it was not too noisy. The lockers could be less noisy and showers could have doors, but overall everything was clean and good. Plus, ther js always some music and common spaces are huge and nice looking. I recommand it to people who have the budget to eat out or have the ability to cook without a fridge, microwave, knife or plate! It’s the kind of hostel that serves the purpose of sleeping and that’s pretty much it. The hostel looks nice of pictures it’s not so bad in reality but I can’t say I had fun there. Showers aren’t the greatest but again they serve their purpose. If you’re only looking for a bed for one night the hostel is find for you but if you’re looking to meet people and fun vibes, not really in the right place. The hostel is ok, but we paid quite a lot to sleep there. Furthermore there was a private party in the common living room. So we could not use it and there was a lot of noise untill after 1am.